What can be done when young adults are faced with extreme problems including water scarcity, wasted water, polluted water, poverty, food insecurity, corruption, terrorism and war? Young people growing up in the Middle East, North Africa and the Mediterranean are being called to be super heroes by their circumstances and by regional and international groups dedicated to ecological, social and economic development in the region. 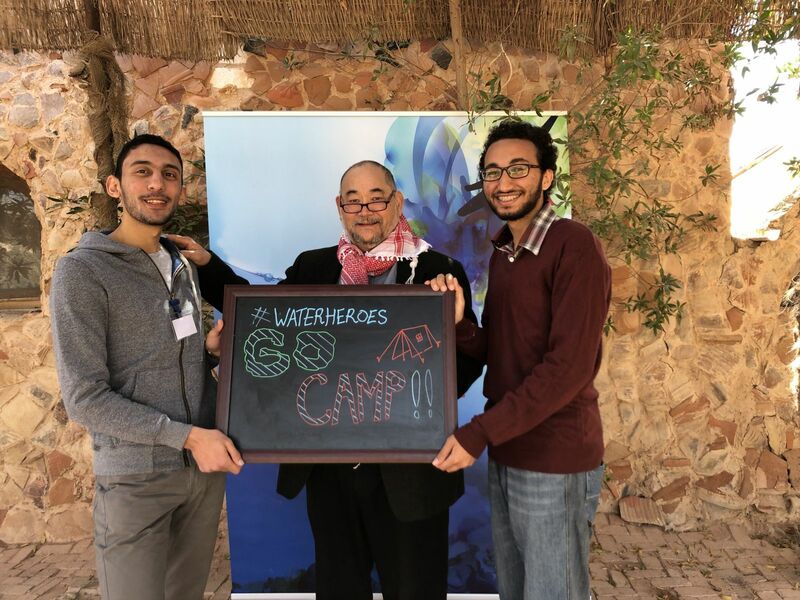 “The Young Water Heroes” workshop was held at the Anaphora Coptic Christian Monastery and Retreat Center between Cairo and Alexandria in Egypt from the 11th to the 15th of March. Led by the Center for Mediterranean Integration (CMI) with the support of the Swedish Institute Alexandria and the CMI WaterHub partners including The Global Water Partnership (GWP), CIHEAM-BARI and other partners. The overall theme was Nature Based Solutions for water problems. Participants from Tunisia, Morocco, Palestine, Egypt, Turkey, Lebanon, Libya, Jordan, Syria, Spain, Italy, France and Greece were chosen from a large number of applicants and joined by several older mentors including Commonland’s Ecosystem Ambassador John D. Liu. The institutional partners have offered some funding to assist but the young people themselves are required to organize and govern their own activities. The participants were shown the “Hope in a Changing Climate” to see what is possible in ecosystem restoration. They were also introduced to the 4 Returns Methodology defined by Willem Ferwerda and pioneered by the Commonland Foundation to create a new restoration or regenerative economy. A lively discussion ensued discussing how restoration practices fit into entrepreneurial ideas. With vast unemployment in the region and huge degraded landscapes, how to make a living by doing what needs to be done is a top priority of all the regions young people. Understanding that the conditions surrounding available moisture are dynamic and connected to soil, vegetation and biodiversity is the way forward for the Middle East, North Africa and the Mediterranean. There is simply no other way forward for the generations alive today. Finding ways to engage everyone in large-scale ecosystem restoration is a high priority especially in massively degraded areas like the Middle-East North-Africa and the Mediterranean. The Ecosystem Restoration Camps concept was also introduced and resonated with many of the participants. The workshop has created a growing network to link young people who are conscious and ready to act to save the region’s hydrology. The network includes face-to-face meeting like this one and online platforms where the young leaders can brainstorm, share knowledge and experiences. The Center for Mediterranean Integration pledged to support this network with guaranteed funding by the World Bank for the next 3 years. Next year there will be another workshop connected to World Water Day for the Youth in the Mediterranean that will focus on the theme of Water Migration.